Purchased Feb. 2, 2016 from Weaver Auction on Proxibid for $99 realized price ($85 with buyer’s premium). Purchased Feb. 19 from Wallace Auction on Proxibid for $414 realized price ($360 with buyer’s premium). Purchased March 1 from Weaver Auction on Proxibid for $286 realized price ($245 with buyer’s premium). As you can see, I paid retail or above prices on each of the aforementioned coins. There’s a reason for this. 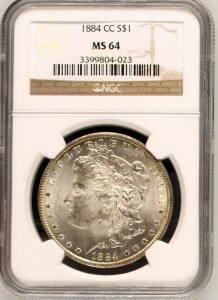 Many bidders are as skilled as I am in selecting under-graded coins in top-tier holders. 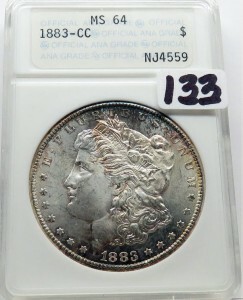 I must have passed up hundreds of Carson City dollars and dozens of 1888-O Morgans in selecting these three. 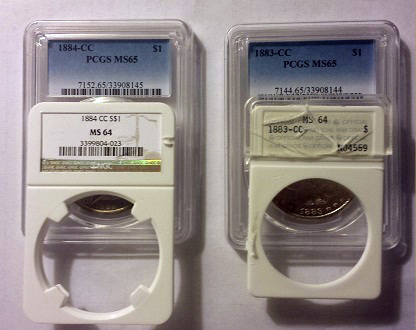 Under-graded coins are scarce and every service, including PCGS, NGC, ANACS and ICG, can be inconsistent on occasion (by a point, typically). The upgrade above netted a $525 retail price on a $99 investment (minus $20 slabbing fee). 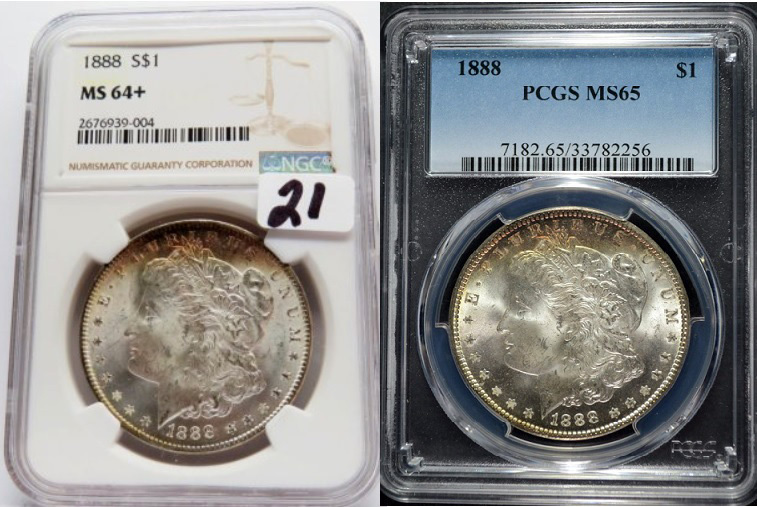 The upgrades shown in this photo netted $560 retail price on a $414 investment for the 1884-CC and a $500 retail price on a $286 investment for the 1883-CC (minus $20 each slabbing fee). 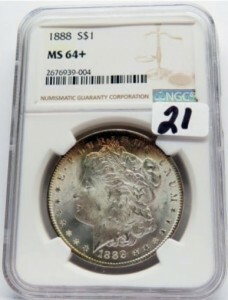 The lesson here does not concern my grading skill; it concerns developing your grading potential so that you can take advantage of the rare under-graded coin in a top-tier holder. As we caution every time we mention cracking out coins, don’t try it unless you learned how to do it from an expert numismatist and know what you are doing — and always wear protective eye gear. Also keep in mind that you can damage the coin by cracking out the holder (even pros experience this from time to time). Finally, there is another option: Don’t crack out the under-graded coin but keep it as a trophy (no need for affirmation if you are satisfied with your purchase). Or send it to Certified Acceptance Corporation for a sticker as your badge of grading prowess. 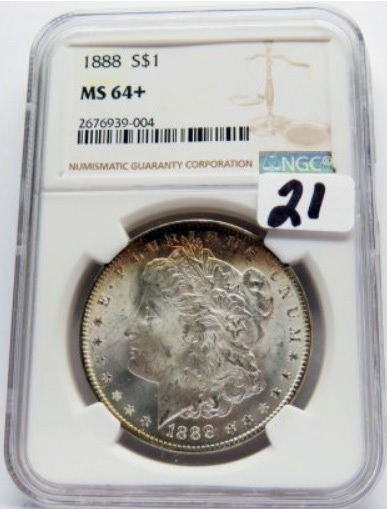 Have you ever cracked out a coin and resubmitted it for a higher grade? Tell us what happened in the comment section below! the 1888 looks like you dipped it then resubmitted. do you touch them up first? I never dip coins. Period. And if I did, the toning on the 1888 would disappear. You’re looking at two photos with different lighting and angles. Thanks, Joe. I appreciate your comment. Concerning dipping, perhaps I should do a post on that. True dipping (Jewel Luster) can destroy a coin. I know dealers who do this and still get grades. On the other hand, a detergent like MS70 sometimes can remove grit without damaging the coin (but not copper). Perhaps I should do a post on this! FWIW: my first coin-cleaning chemical was Jewel Luster and, while I would agree that it has its place and purpose, generally it degrades original luster permanently. “MS-70,” properly applied, works extremely well, removing foreign material without affecting the coin’s metal at all. With (circulated) copper coins, judicious application of a bit of olive oil will restore the appearance of a coin from which a solvent has stripped the surface oils. Thanks for your comment. I’ll write about this in a new post later in the month. My experiences are a lot like yours. 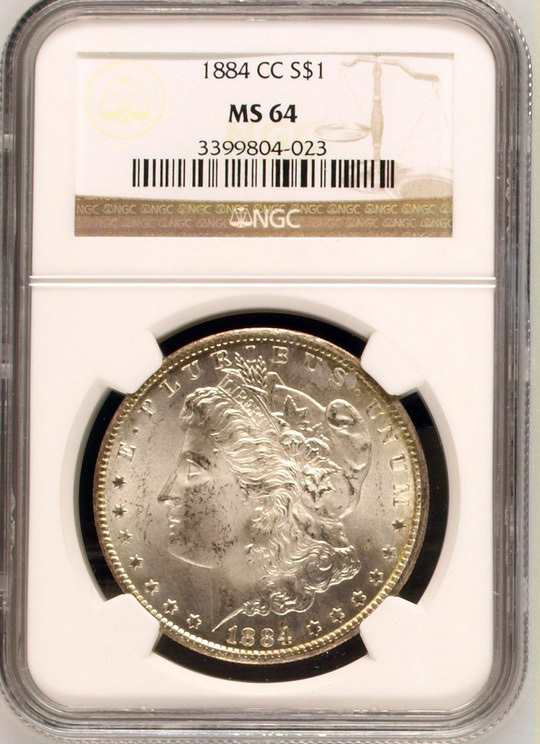 I had no idea that there were so many things that went into coin grading. I always just assumed that a coin that was worth a lot was going to be worth a lot. It makes sense that things like erosion and alterations are going to impact price though, so this was a good reminder. Thanks for taking the time to explain it to a newcomer like me! Grading is one of the real joys of the hobby because when you can do it well, you will increase the education of others … and your own investment!